Bio Shield Series Food Waste Disposers use a permanent magnet motor (new technology) vs. the induction motor (older technology) used in other disposers. Due to the high speed and torque (twisting power) of the permanent magnet motor, most potential jams are eliminated. A common problem with induction motors is that they have a starting winding and running winding. When the disposer is used improperly, i.e. food waste being deposited before starting the disposer, it is up to the starting winding to overcome the load on the turntable. This often results in jamming since the starting winding does not have the torque necessary to overcome many jamming situations. The permanent magnet motor used in the Bio Shield Series disposer reaches full torque on the initial revolution, therefore avoiding the jamming situations as mentioned above. Bio Shield Series disposers motors are almost twice as fast (2600-2800 RPM) as the induction motors (1400 RPM) units. The speed of the motor combined with the design of the grinding chamber results in a faster grinding time than the induction motor disposers. This means the consumer finishes the job much faster, uses less electricity and water, and spends less time over the sink. The nature of the permanent magnet motor requires less electricity than the induction motor on a per minute basis. This fact, combined with the overall faster grinding speed, means that the Bio Shield Series disposer uses less electricity, as well as less water than the induction units. Permanent magnet motors are more compact and lighter (even though more powerful) than the induction motors. This not only provides for more space under the kitchen sink for the consumer, but also makes the installation by the installer a much easier task. Another advantage of being smaller and lighter is that freight costs are considerably lower when the Bio Shield Series disposer must be shipped over land or sea. Prior to the late 1970’s, disposers would jam due to hard food particles or objects becoming stuck between the fixed impellers on the turntable and the grind ring. At that time, the solution used by leading manufacturers was to utilize costly and complicated reversible motors so that if disposers became jammed, they would reverse and dejam themselves easily. However, to eliminate this problem swivel impellers were developed that would swing out of the way if an object became jammed between them and the grind ring. Over the years, almost all manufacturers began using swivel impellers. Since reversible motors were more costly and have more complications and problems than non-reversible motors, most manufacturers eventually dropped this, now unnecessary, feature. However, apparently for marketing reasons, our competitors continue to use reversible motors in their upper-end line. Although it does have marketing advantages, the reversible motor only adds to the cost, weight, and complication of those units. We are proud to say that our disposers use only the advanced permanent magnet motors, which (a) tend to avoid jams in the first place, and (b) if the rare jam does occur, the disposer can be easily dejammed by a simple twist of a broomstick or long screwdriver. As mentioned above, with the use of the permanent magnet motor and the non-metal grinding chamber, the Bio Shield Series disposer is much lighter (sometimes by half) than our competitors’ disposers. This also makes our disposers much easier to install. The Number One cause of failure for our competitors’ disposers is corrosion. Corrosion can cause leaks, jams, and allows bigger food particles through holes enlarged by rusting, which can cause clogging of the drain pipes. Our four top Bio Shield Series models have stainless steel metal grinding chamber parts (turntable, swivel impellers, and the grind ring). This makes the Bio Shield Series disposer corrosion proof. We therefore can offer a lifetime guarantee against failure due to corrosion for the Bio Shield Series 1/2 HP Standard, 1/2 HP Mid-Duty, 1/2 HP Heavy Duty, and 3/4 HP Deluxe models. The Bio Shield Series 1/2 HP Economy model is the only model where the grinding mechanism has the potential to eventually corrode. However, this will not effect the operation of the unit. The purpose of the splashguard is to prevent the ground food waste and water from being splashed back up through the mouth of the disposer. However, with use and age, the leaves of the splashguard can break off. This could be a problem as food waste and water could then splash back and soil the user. There is also a safety concern in that hard food particles (i.e., bone shards, fruit pits, etc.) can splash up through the hole caused by the missing splashguard leaf and cause injury. Therefore, it is vitally necessary that the splashguard be replaced promptly when a leaf does break off. Here the Bio Shield Series disposer offers another advantage over most of our competitors’ units: their splashguards cannot be easily removed or replaced. In order to remove their splashguard from most of their models, the competitors’ disposer has to be removed from the mounting assembly and, if necessary, the plumbing must first be disconnected. All of our disposers have removable splashguards, which can be easily and safely replaced when necessary. With the removable splashguard, it is very easy to lift out and clean the splashguard. Bad odors often arise from a disposer when bacteria growth in the ground food waste accumulates under the splashguard. When consumers own a disposer without a removable splashguard, they are usually unaware that offensive odors are caused by the collection of food particles under the splashguard itself. They might discover this only if, for some reason, they stick their hand in the disposer and wipe the bottom of the splashguard with the back of their hand as they pull it out. If an item (i.e., ring, bottle cap, utensil, etc.) falls into the competitors’ disposer, the item is difficult to locate and take out since the splashguard cannot be removed through the top. With the removable splashguard used in our disposer, finding and removing dropped items is a very easy step. Since the competitors’ splashguard cannot be removed, there is only one size hole in which to put the food waste. The rate of insertion for the food waste would not change. However, with the removable splashguard, the user has the option to remove the splashguard and utilize the larger hole for large batches of food waste. They can then replace the splashguard to operate the disposer. With the splashguard in place, the hole on the competitor’s’ unit is slightly larger than that of the Bio Shield Series disposer. However, when the volume of food waste being eliminated requires a large opening, the Bio Shield Series splashguard can be easily removed, resulting in a larger sinkhole. With the unique Speed Master Mounting System, the Bio Shield Series disposer is very fast and easy to mount. With no special tools required (indeed it can be mounted to the sink without any tools at all), our disposer is the easiest, fastest, and most economical disposer in the world to install. The Bio Shield Series disposer has only four major parts to its mounting assembly. Our competitors’ can have as many as 14 parts with the old fashioned three-bolt system. 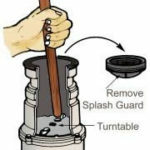 Furthermore, no putty, glue or tools, are required for installation of the Bio Shield Series disposer. Bio Shield Series disposers are packaged in colorful resealable cartons. The cartons are easy to open, and re-close without being ripped or damaged. Our competitors’ cartons are not resealable.